Like many of us baby boomers, Lydia and I don’t have quite enough money to retire, at least not to retire AND travel. So a few years ago we decided to try this new idea of renting out spare bedrooms. Of course today we all know about AirBnB and the “sharing economy.” But 5 years ago it was a pretty outrageous concept. We had two spare bedrooms in the house that were just sitting there, so Lydia convinced me we should give it a try. Now anyone who’s known me in the past would probably see me as one of the last people to want to become an AirBnB host, but if it worked, we could start taking some time to travel. So we went online, opened an account and created a listing for each of our rooms. And when we were done AirBnB figured a price of $117 a night. I was floored. $117 for a bed and a shared guest bathroom. No way. Way. That first year we made about $12,000, mostly on weekends and mostly from European travelers for whom sharing a bathroom with strangers was not an issue. And Lydia and I had a ball. So much so that before the next season began – we learned that the Charleston season for us, given our location close to downtown and the beach, was March-October, with mid-May to mid-August being prime – we made some renovations to the poolhouse to improve our inventory. We put in a bathroom, took out a wall to make it one large, 400 sq. ft. room and bought a good queen bed. We already had a grill on a covered deck attached to what had once been the detached garage. Then we added a few finishing touches and, low and behold, we had a guesthouse. What had been an experiment had now become a business. A good one at that. The 15K we spent on the guesthouse was returned in just a few months, and before we knew it, our little hosting venture became our biggest source of income. Our initial success, which included making “Super Host” in the first year AirBnB introduced it, allowed us to visit Italy for two weeks. It paid for our fabulous Windstar cruise out of Barbados and another from Tahiti. It also covered the less exciting expenses like a new driveway, house painting and a new roof on the guesthouse. More fun were the new kitchen counters and backsplash and a completely rebuilt deck. Landscaping gets its share every year, of course, as do appliances, which suffer from increased use. Interestingly, though, Charleston’s growing popularity has actually caused a decline in our AirBnB revenue. I think it’s because there are just so many more people doing what we’re doing. 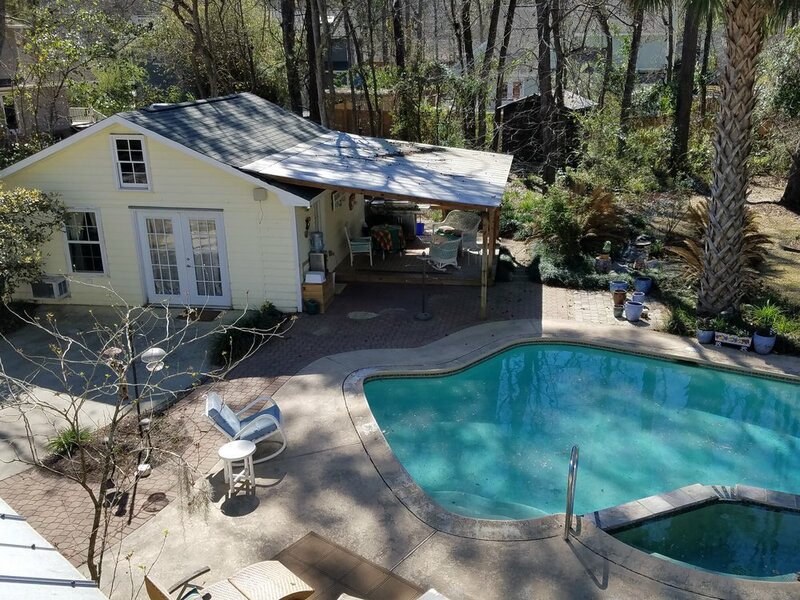 We have a great place for it, with a pool and the separate guesthouse and we’re dog friendly, which is huge, but the number of Charleston-area listings has gone from a few hundred to a few thousand. So rates for our bedrooms, which we no longer rent separately, have declined, and the guesthouse rates have been pretty much stagnant. And this Spring, for the first time, I’ve noticed a decrease in our occupancy rate. Look at me, I sound like a hotelier. But the biggest difference over the last 5 years has been the gradual “Americanization” of the AirBnB product. When we started, most of our friends looked at us funny. “Who would want to rent a room in someone else’s house?” I couldn’t disagree. A Bed and Breakfast was one thing, but a pullout couch in Joe’s basement was something else entirely. Hence all the European visitors the first year and into our second. This was not a strange concept to them. Like everything else, though, American entrepreneurs got a hold of this and found new ways to make a buck. From slumlords in NYC, who plugged their inventory into the AirBnB system and the next thing you know they were the biggest grossing hosts in the system. To the young guys with a few dollars and a real estate market still in recovery, and instead of flipping houses they were fixing them up for short term rentals. And now bigger developers are building purpose-built, short-term rental properties and using AirBnB as their reservations network. Now the market is dominated by what we’ve learned to call “whole-house-rentals,” and its scaring the bejeebers out of everyone from local politicians to home owner associations. In Charleston, which has just passed a new and very strict short-term rental law, complaints centered on parking and noise. Wedding parties were taking up residence in the Historic District and partying till all hours. And street parking, always at a premium on the peninsula, took huge hits when 4 and 5 bedroom homes were being rented by groups that might have a car to park per bedroom. With no homeowner to supervise guest activities (remember “whole-house-rentals”) neighborhoods are being stressed to the breaking point. Good ol’ American greed is about to kill our golden goose unless our town of Mount Pleasant, together with our homeowner’s association, can find the strength and the wisdom to follow Charleston’s lead. For those of you who don’t know this area, Charleston is a huge, international tourist draw. It really is a fantastic place to visit and an even better place to live. And its success over the last 10 years has pushed the hospitality business into the suburbs, where we are. Anyway, Charleston took, I think, a unique approach to the issue of short-term rentals. First, they gave it to a committee and told it to work with the community to find a comprehensive solution, and they gave the committee the time to do it. Next, they decided to balance home-owner rights with community/neighborhood rights. And finally, they wanted something that would be both practical and enforceable. Personally, I think they’ve succeeded. To me, the biggest single problem with short-term-rentals is lack of supervision. This stems from the growth of the “whole-house” phenomenon as a percentage of the overall business. Not having an owner living on the premises just increases the odds of having disruptive guests. Even more important, the owner’s presence maintains the sense of neighborhood. Who wants to have a houseful of different faces looking at you every few days? As far as I know, we’ve not had a single complaint in 4+ years. That’s because we’re here and no guest is going to get out of hand. So Charleston has come down hard on whole-house. Owners must be in residence when guests are present. They’re also very strict with parking. And, unique to Charleston, the new law prohibits newer homes from hosting AirBnB-type guests, at least in the Historic District. All hosts must obtain a permit and business license, which must be part of their listing on AirBnB. Anyone advertising without said permit will be fined and shut down. I hope Mount Pleasant follows suit. And I also hope homeowner associations take notice. HOA restrictions need to change with the times. In the 70s, when ours were written, a home-based business was likely to be a dentist office. Now, most people I know conduct some sort of business from their home. If it doesn’t cause a problem with immediate neighbors and it doesn’t change the essential character of the neighborhood, then the homeowner should be given the benefit of the doubt. HOAs also need to consider local real estate conditions. In neighborhoods that are soaring in value, like ours, cramping the rights of the homeowner to make use of his largest asset could be a recipe for disaster. Forgive the rant. It’s a rainy day in South Carolina’s Lowcountry and Lydia and I are concerned that reactionary forces are beginning to mess with our retirement.